Julen Lopetegui has said he will fight to turn Real Madrid's stuttering season around but could not guarantee he will be in charge for the Clasico against Barcelona on Sunday. Lopetegui's future is in doubt just four months after swapping the Spanish national team for Madrid on the eve of the World Cup. His side face Viktoria Plzen in the Champions League on Tuesday, on the back of five games without a win and having lost all of their last three. "What I've learned about this club is to fight, that is the DNA of this club," Lopetegui said at a press conference on Monday. "That's what we're going to do, fight, both the players and the coaching staff. We know results haven't been great but we are going to turn this around. We are going to fight." 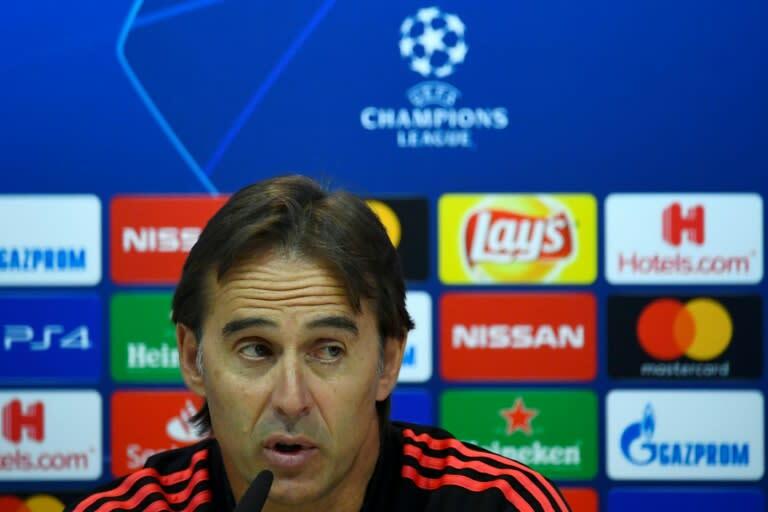 Asked if he knew that he would be in the dug-out when Madrid visit Camp Nou this weekend, Lopetegui said: "I'm here now, that's all I can say. I am the coach at this moment. "If you ask me what is going to happen in a month or a year, I can't tell you. We're focused on the present." Madrid's poor run has left them seventh in La Liga while defeat to CSKA Moscow in the Champions League last month sees them sitting third in Group G.
Key players have offered their support to Lopetegui. Captain Sergio Ramos has said it would be "crazy" to change coach so early in the season while Marcelo insisted the team was "with him to the death" after Saturday's loss at home to Levante. "The players are strong," Lopetegui said. "They are champions not by coincidence, but because they are strong. "They have had bad times and bad moments but they have a lot of strength. They don't get to be champions by believing everything they hear." Isco is perhaps among those most loyal after Lopetegui showed faith in him for Spain, even when the midfielder was struggling for games last season under Zinedine Zidane. "I think it would be crazy (to sack Lopetegui), you have to let him work," Isco said. "He has only been here for two months, if you get rid of the coach you have to get rid of all of us. It is us that haven't been scoring the goals or playing well." Isco was also keen to dismiss the idea Madrid are missing Cristiano Ronaldo, who scored 44 goals in all competitions for them last season. "We can't look for solutions away from the club," Isco said. "We have the solutions to create and score goals inside the club so we don't need to talk about that." Isco took part in training on Monday, along with Gareth Bale, Karim Benzema and Marcelo, all of whom carried injuries over the international break. Dani Carvajal was the only absentee. The defender is still recovering from a calf problem.